Brent has written in with the good news that he and Bernardo topped out on the 14th at 1005h and were the first party of the day to top out! They are now back in Mulas BC safely and making arrangements to head back to Mendoza shortly! On the 12th they headed up to Nidos and spent the night. On the 13th they had a short day to Berlin camp and then helped to bring a climber in distress down to the helipad just above Nidos. They then left at 0200h from Nidos and topped out at 1005h - a pretty quick 8 hours from Nidos to the top! They enjoyed the summit and then returned to Nidos to spend the night of the 14th. On the 15th they dropped down to Mulas with a first load and then on 16 they back-carried the last of the gear. They had debated a push to the Polish Glacier but the route apparently has too much snow on it at this time for a good attempt. We'll have a more detailed report along with pics in a few days! 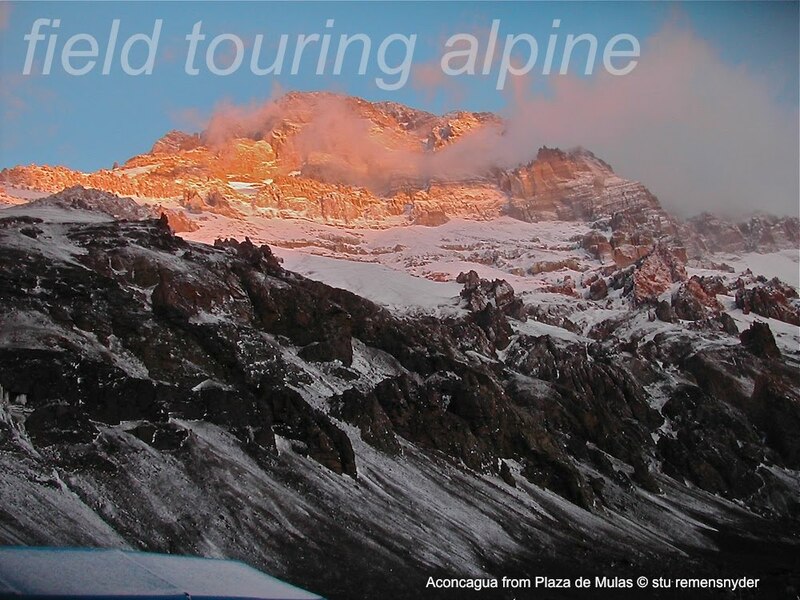 We are accepting applications for next season on Aconcagua so if you are contemplating reaching the highest point in the Americas....drop us a note to "info@fieldtouring.com"! 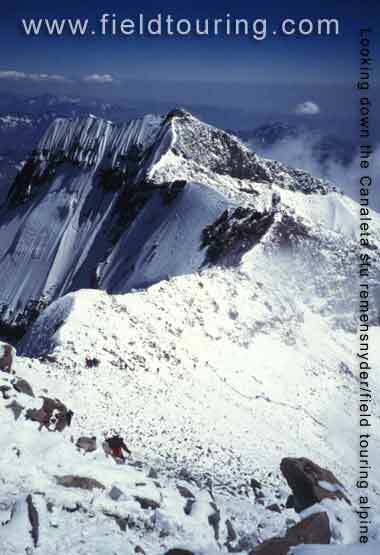 FTA Aconcagua Feb 2011 - Summit bid under way! Our team left on Saturday for summit push and hoped to top out on Sunday/Monday if all went well. We expect them back in Mulas today or tomorrow with hopefully some good summit news! On the 12th they left Plaza de Mulas and moved up to Nidos de Condores to spend the night. The jump is about 1000m and so they planned to see how they were feeling on 13th before deciding to move up or add in a rest day. After moving up to high camp they were going to assess again how they were feeling and either head to the summit early the next am or add a rest day. If they take all the rest days then the summit might well be tomorrow and they'll be back on the 17th just in time to avoid the snow expected to begin in the later half of the day. The weather window is expected to close on 17/18 with some moderate snow headed their way but they have a very good window for this push. If they return without the summit there will still time for them to make a second bid with a summit on 22 or 23. If they come back from the top then they will have lots of extra time for wine tours and golf in Mendoza! We'll pass on the summit bid news shortly! FTA Aconcagua Dec 11 Falso - Summit bid brewing! Brent has written in from BC at the end of a second day of hauling loads to Nidos de Condores to let us know that all is well! After two load carries to Nidos our team has approximately 10 days of food stashed and they are now just waiting for a weather window to open and looks as though they have a few days ahead of mediocre weather before they will see a good window for moving up! They have been moving really well doing the round trips to Nidos in about 4 hours so the acclimatization climbs on Catedral and Bonete have clearly paid off! In a day or so they will begin the push and likely not return to Mulas until after a summit bid unless the weather deters them. The wind can be very strong on Aconcagua and is called the "viento blanco" or "white wind" and we'll hope they do not encounter it! The weather reports in the days ahead suggest very strong winds for the 12th and then less strong for the next 4-5 days. It seems they will have good weather through the 17th but nevertheless we'll keep a watchful eye! Brent and Bernardo are having a great time and already scheming for the next climb to come after Aconcagua. It seems climbers are often barely begun on one project before they dream of the next and our climbers are no different! 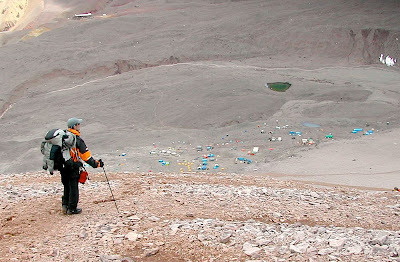 For many people the altitude and severe weather on Aconcagua provides a great stepping stone for a first 8000m peak like Cho Oyu or Broad Peak. Having a good experience sleeping at approx 6000m/20000ft and climbing to near 7000m/23000ft is important for gaining the confidence and experience to tackle a peak in excess of 8000m/264000ft. It can also enable a climber to take on a more technical peak like Ama Dablam or Satopanth and know they will be able to focus on the climbing and less so on the altitude. In fact due to the southerly location of Aconcagua it is often considered to behave as an mini 8000m peak with "thinner" air than a mountain of the same altitude in a more equatorial location like Nepal. As I understand the core theory, the earth spins it keeps a thicker layer of atmosphere at its middle and less at its extremes. I have seen one report that the troposphere reaches 12-15km high in the tropics and only 8-10km at the poles. The temperature being colder in the polar regions is said to have an even greater effect on the perceived altitude. Denali is said to fool people into thinking less of its ~20,000ft altitude when it acts perhaps more like 23,000ft Himalayan peak. Interesting stuff and yet another reason to acclimatize carefully and listen to your body! 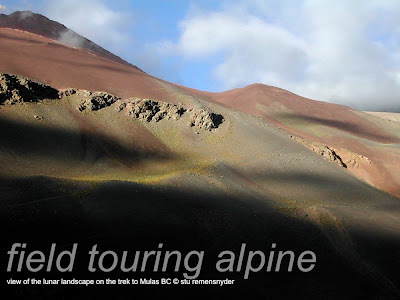 for more fun i have added a few links on the topic of latitude and climbing...enjoy! We have spaces available still on all of these trips but some of them are filling fast! 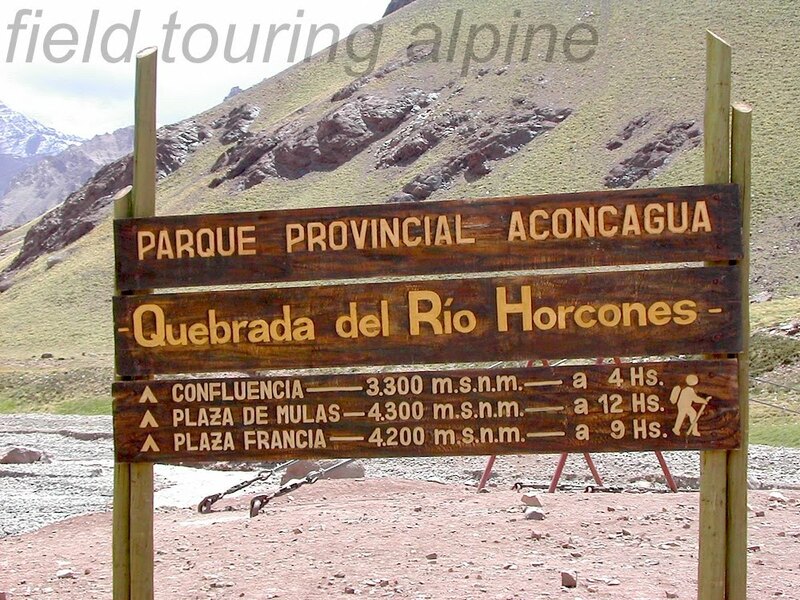 FTA Aconcagua Feb 2011 - Acclimatization Summits! Brent has emailed in from high tech Plaza de Mulas to let us know that all is very well with him and Bernardo! They had an awesome day yesterday climbing 2 summits and enjoying getting some ice climbing in as well. On the 8th they topped out on Cerro Bonete (4950m) and Cerro Catedral (5265m) during a beefy 9.5 hour/11km day ascending 1800m of hill in that time. On Catedral they had a nice stretch of 300m of 30° ice and both felt strong! They had planned to do only Catedral but the morning weather was iffy so they tromped over to Bonete in the morning. They then found the weather clearing up and sound not pass up the opportunity to knock off Catedral! This very full and demanding day bodes well for a summit push which will be around 1000 meters and 6-10 hours to the top. The plan for the 9th is carries up the route to Canada or Nidos and then on the 10 to rest up. On the 11th if the weather is good and they feel well they will begin to push! FTA Aconcagua Feb 2011 - Heading to BC! Our second team for the 2010-2011 season is off and running! They have gathered in Menodoza, sorted gear and made their way to the mountains already! After a few days of travel and acclimatizing they began the 2 day trek to Plaza de Mulas on Saturday, Feb 5 and have been enjoying a rest day today building rock walks for their tents! Their trek took them from the Horcones Ranger station to the Confluencia camp (3300m) and then to Plaza de Mulas (4300m). 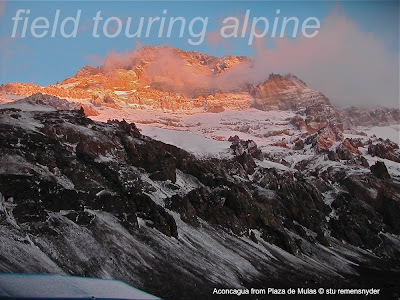 Along the way they have enjoyed the beautiful and stark lunarscape of the valley, views of the south and west faces of Aconcagua and finally the bustling village of Plaza Mulas. Confluencia offers beds, restaurants and more while Mulas is even more upscales with internet cafe's restaurants and even a large hotel. Most climbers will take full advantage of the soft beds at some time or another and they are a welcome option after the summit and many days on uneven rock snow and ice! Having arrived at Mulas BC (and had a well earned rest day) they will now begin the process of acclimatizing on the mountain with trips to Camp Canada (4900m) and Nidos de Cóndores (5350m) before making a concerted push on the mountain. They are also considering some other acclimatization options including Bonete (approx 5004m) across the valley from Aconcagua. There is a call for 3-4 days of poor weather during which time they will hope to get in lots of acclimatization and be ready for summit push! If all goes well they should be making a summit bid on or about the 16th of February!